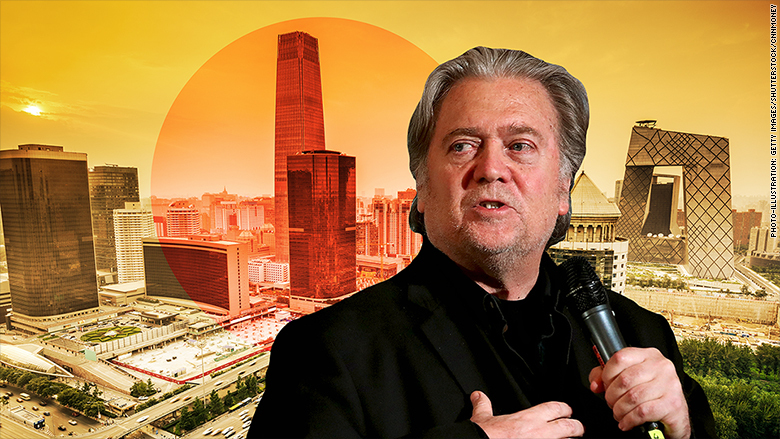 What's Next: Steve Bannon on China: The former Trump White House chief strategist and fierce trade hawk believes the US needs to take an aggressive stance toward China to stop it from stealing Silicon Valley's intellectual property. • "Last year, Trump came up with a three-prong attack that literally blows China out of the water: Essentially a quarter of a trillion dollars in tariffs, implementation of 301 sanctions and action against ZTE." • "When the US team delivered their Chinese counterparts a 56-page detailed report on what America was prepared to do and why, it hit like a bomb. They never thought we'd think of these measures, or that a president would think to use them." • "Then the Wall Street clique, including my dear friend Steve Mnuchin, totally panicked and muddied the waters, limiting it to tariffs on agricultural products and natural resources. He snatched defeat from the jaws of victory -- a historic win that president Trump has been thinking about for 25 years." • "The action against ZTE and its component supply chain shows you why China's 'Made in China 2025' initiative" -- which would make China the leader in chip design, artificial intelligence and robotics -- "is so urgent for them. They understand their weakness, how inextricably linked they are to the West." • "The Chinese always want conferences and 'strategic and economic dialogue,' it's always 'strategic and economic dialogue.' They're used to just tap, tap, tapping us along, and historically administrations have fallen for it. Meanwhile they continue to rise, we continue to get weaker, and we talk." • "Xi Jinping's economic adviser Liu He is as smart as they come." The Big Picture: Bannon is out of the White House, but he still represents its original 'America First' vision, which may well end up guiding it on some of these issues. Many in Silicon Valley, Wall Street and Washington will disagree with his aggressive proposals, but those we've spoken with share his concern over China's technological rise and the threat to US dominance. And ICYMI, please read the new POLITICO investigation: "How China acquires 'the crown jewels' of U.S. technology," by Cory Bennett and Bryan Bender. • ZTE now estimates that the US ban on its supply chain will result in at least $3 billion in losses, a catastrophic blow to its business, per Bloomberg. • The US has retracted it invitation to China to participate in a military exercise due to Beijing's militarization of islands in the South China Sea, per WSJ. We're en route to Seattle. Seattle Times online lead: "Watch: Bald eagle battles fox for rabbit in skies above San Juan Island." Despite Seattle's bitter head tax dispute with Amazon, San Francisco and other Silicon Valley cities are considering plans to impose their own taxes on large employers. San Francisco, Mountain View, Cupertino and East Palo Alto are all considering plans to impose a "head tax" on major businesses to help deal with homelessness and the lack of affordable housing. • "Technology companies have long maneuvered to kill local taxes, deploying a mix of public posturing and backroom wrangling. ... For cities looking for more largesse from their hometown giants, there's always the threat that tech companies will expand elsewhere. The companies fear that one tax increase will lead to another and, before they know it, they'll find themselves underwriting the People's Republic of San Francisco." • Seattle's head tax effort was a failure. It was opposed by Seattle's business community, at least two former mayors and, most importantly, a majority of the city's voters. In the end, Seattle levied a watered-down version of the tax that alienated the business community and will bring in half as much revenue as the city said it needed. • While Amazon's opposition to the head tax was widely supported, the company came out looking insensitive to the plight of the homeless -- despite the fact that it has several initiatives in place to help Seattle's homeless, including a permanent family shelter on its South Lake Union campus. The Big Picture: There is still a massive opportunity for progressive politicians and tech leaders to innovate on solving the homelessness issue, but it requires working together rather than going to war with one another. Snap is launching a new apprentice program for users called Yellow. Snap VP Nick Bell tells me the company will select ten users or teams of users from around the world to participate in a three-month program at their headquarters in Venice. The users will receive funding from Snap, workspace and mentorship. "We see this as a great opportunity to embrace people who are great storytellers," Bell tells me. "We will provide them with funding, office space, program access, launches -- and help bring their ideas to life." The Big Picture: Snap is looking to differentiate its product form Facebook and wants to encourage users to think of innovative ways to use the platform. The company says it is seeking users with "an innovative concept and a fresh voice." Apply at yellowla.com. The company has lost yet another executive. Snap's VP of monetization engineering Stuart Bowers has been poached by Tesla. Cheddar's Alex Heath reports that nearly a dozen members of Snap's senior leadership have left since the company went public in early 2017. • IBM's Ginni Rommety says IBM will add 1,800 jobs in France and expand its online AI training program with Udacity. • Lyft's Jon McNeill has announced a $100 million investment in driver support centers, offering oil changes, basic maintenance and serviced car washes for drivers. Comcast says it is preparing an all-cash bid for 21st Century Fox assets that will exceed the $52.4-billion from Disney. "The work to finance the all-cash offer and make the key regulatory filings is well advanced," Comcast says, though they state "no final decision has been made." How much might Comcast offer? Our best sources predict it will be north of $60 billion, because all things being equal Rupert Murdoch would rather sell to Disney. What's Next: Comcast will likely wait to make its decision til June 12, when a federal judge rules on the AT&T-Time Warner acquisition. If that gets approved, Comcast is likely to move forward, forcing Disney to consider a counter-counter offer. The Big Picture: Disney and Comcast are fighting for scale, and self-preservation, in a world increasingly dominated by Apple, Amazon, Alphabet and Facebook. Netflix has acquired rights to "Six Underground," an action film from director Michael Bay, actor Ryan Reynolds and Skydance Media. The film will be Netflix's biggest feature yet. The Big Picture: Netflix is expanding beyond low- and mid-budget productions and taking on major projects that used to belong exclusively to old Hollywood. Michael Bay on Netflix is a landmark moment in tech's ongoing disruption of Hollywood. What It Cost: Netflix's commitment is around $150 million, per Deadline. Bonus: Spotted last night at Papilles, a little French restaurant on Franklin near Netflix's Hollywood headquarters: CEO Reed Hastings, Chief Content Officer Ted Sarandos and other members of the Netflix brass. What Next: NYT's Charles McGrath remembers Philip Roth, who died last night at 85. My favorite Roth quote: "All that we don't know is astonishing. Even more astonishing is what passes for knowing." See you tomorrow from Seattle.